Fushi Villa is located cliff-side of Lance Aux Epines. This family friendly villa would also be a great place for up to three couples to vacation together, and is welcoming to groups. There are five bedrooms, each with air-conditioning and an en-suite bathroom. Guests of Fushi Villa will enjoy taking advantage of the views offered and the amenities, which includes the large swimming pool. Whether you stay here with your family or with friends, Fushi Villa is one of the most popular villas on the island and is sure to please a wide variety of tastes. Fushi is a five-bedroom house build on the edge of a cliff in the high end area of Lance Aux Epines with views of the sea and gardens down to the rocks. The villa is set out for maximum comfort. Each bathroom has modern fittings, tiles, and powerful showers. The villa has a light airy feel, enjoying a sea breeze through the house at all times of the year but has air-conditioning and fans in every bedroom. The grand hallway takes guests through to the living room, and then into the kitchen. There is also a separate air-conditioned TV room with plasma TV and DVD player. There are hardwood floors throughout the main room downstairs and cream porcelain tiles throughout the rest of the house. The kitchen is just off the main living area, and centered around an island which seats four people. There is also a breakfast table for four. The kitchen leads directly to the outside where there is further shaded and covered seating. A large American subzero fridge freezer with ice and water dispenser, microwave, electric hob, and cooker outdoor gas grill are available for guests’ use. The master bedroom is based on the ground floor for ease of access. It is shielded from the main house by a double entrance way. This room is furnished with a large super king-size bed, plenty of wardrobe space, large mirror, console table, and chair. The large en-suite bathroom offers a wet room and double shower. The walls and floor are tiled in limestone. There are four bedrooms upstairs all en-suite. There are two sea-facing double bedrooms with their own patio area. One bedroom has a Super King bed with shower. The other double is a king-size bed with bath and shower along with a vanity unit. The other two bedrooms are both large twins with their own en-suite bathrooms with showers and super modern vanity units. They are all air-conditioned and have large storage areas. Each of the rooms has blackout curtains and air-conditioning. 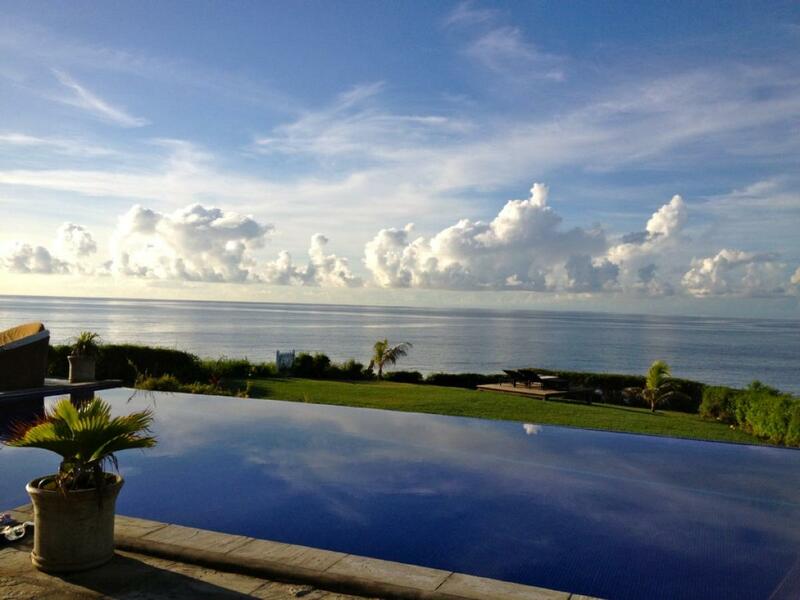 This villa is probably one of the grandest family accommodations in Grenada. It is a ten-minute drive from the airport and most restaurants and popular beaches are a short drive away. Or just stay in the villa and enjoy the amazing sea view. Prickly Bay is about a 2 minute drive from the villa. You can swim there but most guests drive the 5 - 7 minutes to Grand Anse Beach, the best beach on the island. Guests will be met at the airport and escorted to the villa. Guests follow in their rental car. Fushi Villa accommodates 10 people really well. It is well decorated and spacious, with lots of open areas to chill and relax. The pool area is great! The staff looked after us really well without being intrusive. Fushi is well worth the money.